We hope this page will be a helpful resource for homework, additional practice and enrichment. If you have questions about the mathematics students are learning at school, we encourage you to contact your child’s teacher. (*See below. )If you find resources that are not included on this page that you think may be helpful to other Ramapo Central students and parents, please forward them to Patti Lippman (plippman@ramapocentral.org), Information Services Specialist, in the Office of Instruction. 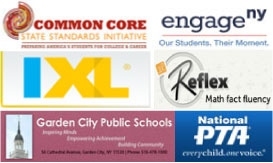 Please peruse these sites for descriptions of the Common Core standards rather than for specific math practice tools. The sections below this one offer resources that are more tailored to specific topics in a math curriculum. The CCLS are the standards that determine what students should know and be able to do at each grade level. This link points to a series of videos to explain math concepts and demonstrate teaching strategies. Math coach Nick Timpone takes viewers from standards in kindergarten through Grade 5 and demonstrates hands-on ideas, games, activities and models that parents can use to help their children with their homework. This site includes resources and a toolkit for parents and families relating to curriculum and assessment. This site includes grade-specific summaries of the Common Core standards at each level. They are available in English and Spanish. The sites below offer descriptions and videos of math topics, as well as dictionaries of terms. They are available to the general public without a subscription. A Maths Dictionary For Kids A Maths Dictionary for Kids is an animated, interactive online math dictionary for students which explains over 600 common mathematical terms and math words in simple language. An additional section of the site called Math Charts contains a collection of over 200 printable maths charts. A link is available from the site home page to the iTunes store to download an app called Math Charts with in-app purchases.Cool MathCoolmath’s online dictionary contains formulas, definitions, properties, diagrams and examples. Some subjects contain links to more information like lessons or examples. The site uses a grid of letters that link to the math terms beginning with that letter. of grade specific videos on their YouTube channel. This is an extensive, free website providing videos and lessons. It is searchable by Common Core standard or by keyword. It requires an account setup, which can be done in just a few minutes. You may also find this video helpful to learn more about using videos to support your child’s progress. Math.com Glossary Math.com is a full-featured site with tabs for homework help, practice, tutoring, calculators & tools, and games. The glossary page is an alphabetical list of math terms. Clicking on a term causes the definition to pop up on the same page.Oakdale Joint Unified Central School DistrictEngage NY Homework provides additional practice for math that is learned in class. The site is intended to help guide students/parents through assigned homework. You will see a sample of what was done in class and how it was completed correctly.Be a Learning HeroLearning Tools on this site are helpful resources developed by our partners to support your child’s learning in Mathematics and English Language Arts at home. Search by grade level, subject or specific type of resource. The following resources are available through Ramapo Central School District subscriptions. Students receive both login information and support from their teacher. As students progress through these resources, teachers may assign specific areas of focus to students. As a result, student login information is unique to each student and should not be shared. Please contact your child’s teacher with any questions about using these resources. A comprehensive math practice program, IXL covers more than 2,500 distinct math topics in a progression from pre-kindergarten to high school. Students may login* to this site for targeted practice. Any student who understands the basic concepts behind the operations (addition and subtraction, or multiplication and division) is ready to start working in Reflex. Students may login* to this site for targeted practice with basic math facts. *For login info, please contact your child’s teacher. To contact your child’s teacher, rollover the “Our Schools” tab above (the top navigation at www.ramapocentral.org), and select your child’s school from the drop down menu. After you have reached the home page of your child’s school, go to the “About….” tab on the building top nav and click on “Contact Us.” A page will open with a list of staff members and clickable links to their email.